GO THE PINK DOG IS BACK! VICTORIA AND TASMANIA ERUPT IN CHEERS OF GO THE PINK DOG! Greyhound Racing Victoria (GRV) and Tasracing in conjunction with major sponsor SKY are running the Go The Pink Dog! campaign that will continue throughout February with all proceeds going directly to the McGrath Foundation. Every time a greyhound wearing the pink number 8 rug wins a race in Victoria or Tasmania during February, $500.00 will be donated to the McGrath Foundation to help fund additional McGrath Breast Care Nurses across the country. This year, AFL legend Jonathan Brown and wife Kylie headline the support for the campaign. 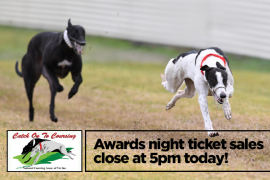 Triple premiership hero Brown, is a big supporter of greyhound racing and is excited to be able to combine his passion for the sport, with something that helps the community.